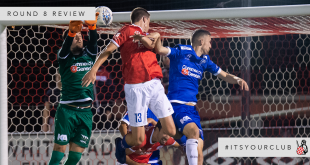 The Melbourne Knights are staring down one of the darkest periods in the clubs history as relegation becomes increasingly more inevitable following a 4-1 loss away to Port Melbourne on Friday night. It was a match reminiscent of last week’s loss to Bulleen. Another brain fade in the second half seeing the side go behind 3-0 in the space of 5 minutes of madness. 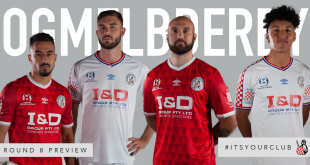 These mental lapses have been a common theme for the side all season long, going back all the way to the round 1 capitulation of a 2-0 lead to Hume City. A result which would go on to set the tone for what has followed since. In total the Knights have conceded 15 goals in the final 15 minute period of matches, 5 of which have come in injury time. The side has on 4 occasions lost by more than 3 goals, which includes a club record home loss of 6-0 at the hands of Oakleigh. Now. with the side sitting on 17 points from 19 matches, it is the clubs lowest points to game ratio since 1962. 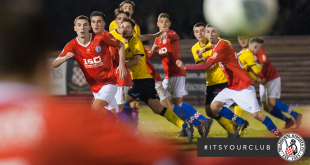 Going into the Port game Knights coach Eric Vassiliadis made three changes to his starting eleven, bringing in Danny Dixon, Anthony Dezic and Luke Jurcic. The first half against Port Melbourne flattered to deceive with neither side gaining the upper hand in the tight affair. The uneventful half only provided a few chances, Dixon coming closest for the Knights with two long range efforts that forced excellent saves from the Port keeper Brendan White. All the real action came in the second half beginning with Port taking the lead on the 61st minute with one of the goals of the season. Zane Sole’s dipping shot from 30 meters out went straight into the top corner giving Fraser Chalmers no chance of keeping it out. As has happened many times this season that lone goal was enough to see heads drop for the Knights and predictably two more goals followed swiftly in the next 5 minutes, Andreas Govas and Oleksiy Khrapko netting the goals for the home side. The Knights pulled a goal back on the 74th minute, a defensive error gifted Tom Cahill the ball leaving him with only the keeper to beat as he slotted it home for his 8th goal of the season. Port would however restore their 3 goal lead in the closing minutes, Khrapko rounding Chalmers as he bagged his brace and put an end to any far fetched hopes of a late Knights comeback. The loss leaves the Knights further entrenched in 12th – the relegation playoff position. 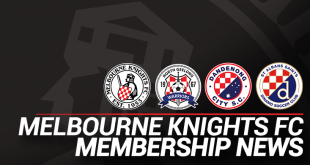 The two consecutive losses to Bulleen and Port have seen both of those sides pull away from the Knights, leaving only Kingston City within realistic touching distance. 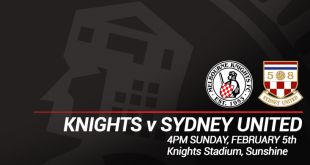 The Knights will need nothing less than 3 points in their upcoming match when they take on top 6 side Avondale FC at Knights Stadium next Friday night. Kick-off at 8:30pm. 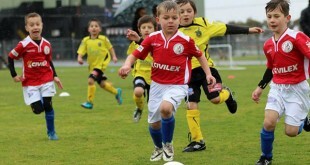 Melbourne Knights: 1.Fraser CHALMERS, 2.Luke JURCIC, 3.Shaun TIMMINS (23.Timmy PURCELL 87′), 4. 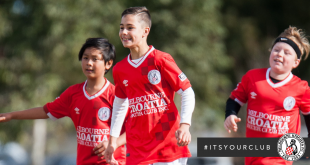 Ben SUREY, 6.Milan BATUR, 12.Anthony DEZIC, 13.Tom CAHILL, 15.Danny DIXON (9.Kym HARRIS 84′), 16.Jason HICKS (10.Marijan CVITKOVIC 66′), 17.Mehdi MARTIN, 27.Elvis KAMSOBA. Not Used: 8.Kamal IBRAHIM, 20.Gabriel MATTI, 32.Marcelo DE LA PLAZA SANCHEZ. 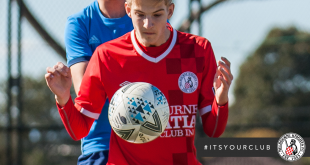 Port Melbourne: 1.Brendan WHITE, 5.Michael MCGOWAN, 8.Anthony COLOSIMO, 9.Oleksiy KHRAPKO, 10.Francesco STELLA, 12.Perry LAMBROPOULOS, 14.James PAPADIMITRIOU, 15.Kobbie BOAHENE, 17.Zane SOLE, 18.Alan MULCAHY, 21.Andreas GOVAS. Goals: Zane SOLE 61′, Andreas GOVAS 64′, Oleksiy KHRAPKO 66′, 87′.